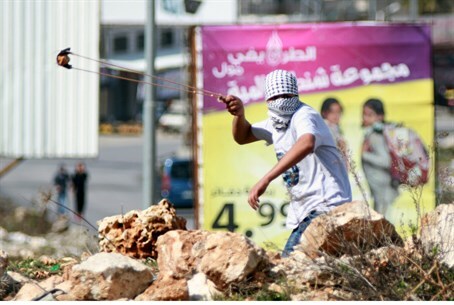 Arab MKs livid as Knesset plenum passes bill that toughens the punishment handed out to rock throwers. The Knesset on Monday evening approved the second and third readings of a bill that toughens the punishment handed out to rock throwers. 69 MKs voted in favor of the bill, while 17 voted against. The law stipulates that the offense of obstructing an officer by throwing rocks or other objects is punishable by five years in prison. The law also establishes a hierarchy of punishment for offenses involving the throwing of rocks or other objects at a vehicle in motion. Arutz Sheva has frequently reported about rock attacks, which have become frequent occurrences in eastern Jerusalem, Judea and Samaria in recent years, but are ignored by most mainstream news outlets. Such rock attacks can be lethal and are often carried out by terrorists with that intention. An example of this occurred just a week ago, when a Jewish couple narrowly averted death when terrorists threw rocks at their car as it was travelling in central Israel, on Highway 6 that crosses Israel from north to south. During the debate on the law on Monday, Arab MKs from the Joint Arab List voiced strong objections to the bill. MK Hanin Zoabi attacked the law as well, using the opportunity to lash out at IDF soldiers. Former Justice Minister MK Tzipi Livni (Zionist Union) joined those who welcomed the new law. "While rocks were thrown this evening at the Jerusalem light rail a few miles from the Knesset, the plenum approved the law toughening the punishment for throwing rocks, which I initiated as Justice Minister due to the worsening violence and terrorism in Jerusalem after Operation Protective Edge,” said Livni. “I congratulate Justice Minister Shaked who continued the work and welcome the law being passed in the Knesset. The security and law enforcement systems were given more tools today in the fight against terrorism and violence,” she added.